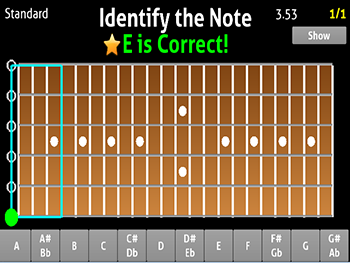 I developed an app to help memorize the notes on the fretboard called "Fretboard Learn". It has a bunch of different game modes to practice on (identifying the highlighted note, finding note X, finding all X notes on the neck). You can select what frets and strings to focus on, and even change up the tuning. It's up for FREE on the Google Play Store at the below link. Check it out and let me know what you think. Is it free? Ad supported? etc.? The app is free, supported by ads. Wanted to make something clean and simple to learn the notes of the fretboard. Has a few different game modes to practice on. Also some settings for the different types of players out there (left/right handed, various tunings). Latest update include sound for guitar and bass - so you can now do some ear training too. Also added the app to the amazon app store if anyone has a Amazon device. It's useful. Nice work. Thanks.